Here is a 1914 Tilling Stevens TS3 with a 1909 Newman O40RO body. She was once registered as CD4952 and is resident at Amberley, where we see her on 21 September 2014. 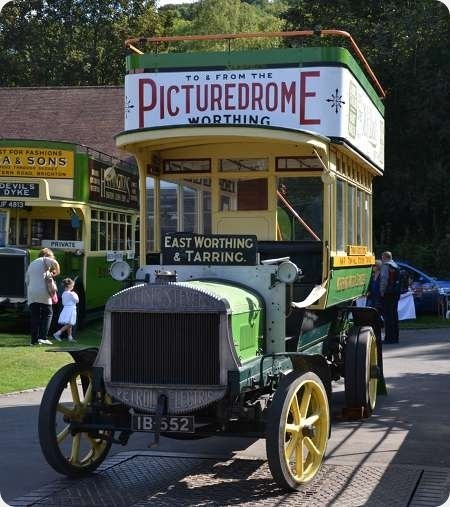 Whilst she is normally regarded as a Southdown vehicle, she’s actually lettered for Worthing Motor Services, a precursor of Southdown. The Northern Ireland registration is not part of the current fad for such things, in order to disguise the age of the vehicle, usually a coach. No, the history of Wilts & Dorset mentions that Southdown and Wilts & Dorset shared management at one time. That management had some peculiar arrangement whereby their vehicles could be registered either in Brighton or in County Armagh. The IB plate relates to her original registration. The pre-war (1914-18) Tilling-Stevens machines of this type were TS3. With some post war refinements the model became the TS3A. Much misinformation abounds about Tilling-Stevens in print and on the internet. The TS3A is sometimes stated to have been a forward control model. It was not. The first Tilling-Stevens forward control models were the TS6 and the TS7, though some TS3 and TS4 buses were modified to that configuration with some design input from Maidstone. The ‘A’suffix to Tilling-Stevens nomenclatures did not signify forward control (‘B’ indicated normal control) until the advent of the B9/B10 and the subsequent models of 1926 onwards. The TS3 was initially conceived to replace the lightweight TTA1 and meet the stringent conditions laid down by the Public Carriage Office of the Metropolitan Police for operation in London – maximum length: 23ft 0 ins, max width 7ft 2ins, max wheelbase 14 ft 6ins, max laden weights:- front axle 2 tons, rear axle 4 tons, max unladen weight of vehicle 3 tons 10 cwts. The famous London B and the later K type were also designed to conform with these conditions. As delivered, the machine shown above almost certainly had the protective vertical bars in front of the radiator, a feature that Tilling-Stevens retained after other manufacturers had adopted styled grilles in front of the radiator proper. This gave Tilling-Stevens machines an antiquated appearance that, in respect of the B10 in particular, was not borne out by their reliable performance. Tilling-Stevens offered the heavier TS4 for provincial operation, but the TS3A seems to have been the preferred model for many operators at home and abroad – it was quite successful in the export market. A further note to the above. The TS3 was significant in being the first Tilling-Stevens model to accommodate transverse seating in the lower saloon, but the preserved example at Amberley carries an older style body with perimeter seating. It is, of course, a splendid restoration, but it is not a true representative of its type.